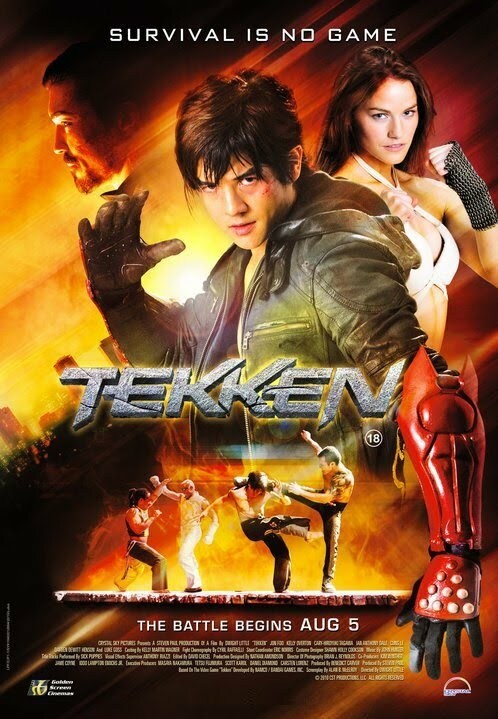 The Billionty-Oneth Geek: DTV Madness: Tekken!!!! I think the first Tekken game came out when I was just hitting my teen age. Although a few of my friends got really into the game, I just couldn't muster the same love for the game. Even before it was released, I was raised on Street Fighters and Mortal Kombats — not this no-fireball nonsense. To its credit, Tekken had a really deep, technical and intensive combat system, but I guess I just preferred something easier... plus, I liked fireballs and fatalities. It seems as though there is going to be a triad of bad movies based on fighting video games. The gauntlet was laid down last year with release of the box office smash hit Street Fighter: The Legend of Chun Li (cue sarcasm). Not to be outdone, Namco answered the challenge with Tekken and SNK also threw their name into the hat with The King of Fighters, which should be out soon. But let's talk about Tekken. Tekken takes place in a futuristic Earth, where the continents are taken over by corporate entities. We follow a young fighter named Jin Kazama as he seeks to avenge the death of his mother, killed by an evil group led by one Heihachi Mishima, who also happens to be president of the Tekken Corporation. 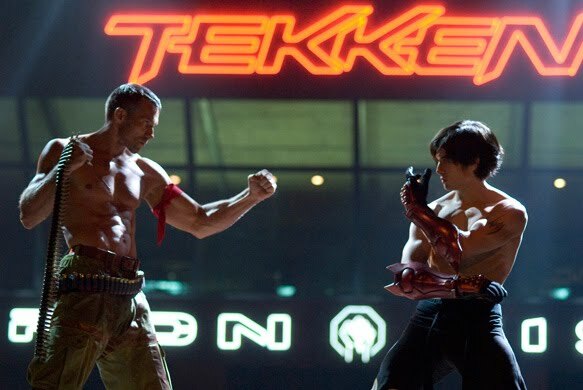 However, in order to get to Mishima, Jin needs to enter a tournament held by the Tekken group — a tournament to find the toughest fighter in the world. Now, I don't know the Tekken canon very well, so I'm not too sure if the story followed the game's story closely or not. It's pretty much a straight up action movie with a few cheap twists along the way. The tournament element of the movie made it really similar to Mortal Kombat, in that our hero needed to enter himself in in order to get to the big boss. Speaking of Mortal Kombat, Cary Tagawa who played Shang Tsung in MK also played the big boss in Tekken. If only he played M. Bison in Street Fighter, he could have completed the set. Bryan Fury VS Jin Kazama! The movie is filled with a handful of characters from the video game and thankfully, doesn't make the mistake of over-saturating it a la Mortal Kombat Annihilation. Many of the characters though have little significance to the story other than being fodder for the next fight sequence. So as per DTV standards go, I was quite entertained with the movie. The movie was action packed and hardly let its guard down. The movie clearly used some small sets, but they did well with the budget they were given and it ended up looking pretty good (again, as per DTV standards). We don't get many cyber punk movies nowadays, especially in the mainstream and I thought it did a good job of adding a bit of that element to it. What can I say? I was entertained. I enjoyed it much more than I did with last year's Street Fighter and I think it's mostly because they kept the story simple. So give me a simple story, throw in some action, mix in some cheesy dialogue and at 80 minutes, you can't go wrong. King of Fighters, let's see what you've got! Til next time, later geeks!